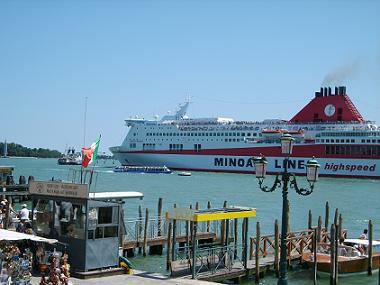 Venice has several ferry lines to Greece and Croatia. On the picture below is a ferry boat sailing along St. Mark’s Square on his way to Greece. The boats dock in the Marittima port. This harbour is especially for the larger ships. Large cruise ships also dock in the Marittima port. Greek shipping line with 10 large ferry ships. The ‘Sophocles Venizelos’ is a ferry ship on the Venice-Igoumenitsa-Corfu-Patra route. It can take 1500 passengers and 700 cars. Facilities are a restaurants, bars, casino, shops, ATM and Wifi internet. The ‘Eleftherios Venizelos’ can take 2500 passengers (1600 beds) and 850 cars. Anek Lines has the same destinations from Venice as Minoa Lines: Igoumenitsa, Patras and Corfu. Departures are from the Marittima port. High speed catamaran ferry boats to Croatia.